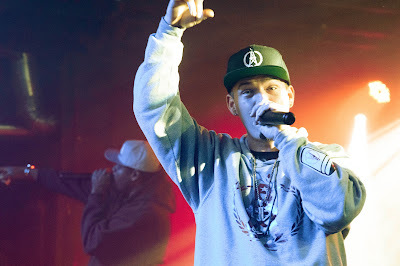 Houston hip-hop mainstay and Swishahouse affiliate Paul Wall returned to Kansas City on Thursday night. Although the rapper's Riot Room show came on the eve of his new album, "Bounce Backs Over Setbacks," his 40 minute set was heavy on the hits. As his performance began, Wall gave shoutouts to Rich The Factor, Gates, and a handful of other Kansas City institutions. The rapper had brought out a solid crowd for a freezing Thursday night, and while the room never grew too chaotic, plenty of fans allowed themselves to sink into Wall's chopped-and-screwed grooves. Between rousing renditions of party tracks like "I'm So Throwed" and classic verses from "Drive Slow" and "Grillz," he flashed his signature diamond-encrusted smile and shook every hand thrown at him. Wall was so likeable that even a warning against drunk driving elicited cheers.